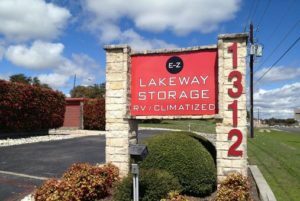 Lakeway, TX 78734. We are on the west side of 620, near Debba Drive with red doors. Our customers have 24 hour access through a coded gate. Use your own lock to secure your unit. The facility is monitored by cameras, and well lit. Drive up, garage style storage. Uncovered outdoor lot for RVs, boats, trailers, or autos.